Laser skin resurfacing has been called the anti-aging breakthrough of the 21st Century. New technology has greatly reduced the side effects that normally accompany skin resurfacing. The term fractional CO2 laser resurfacing actually refers to two different types of laser skin resurfacing procedures, ablative and non-ablative. Both treatments are highly effective anti-aging procedures, and they can be used to correct mild to severe skin problems ranging from dark spots to deep wrinkles. Using the latest laser technologies and applications, ablative and non-ablative skin resurfacing can deliver dramatic results. Ablative fractional skin resurfacing, also known as fractionated or pixilated carbon dioxide (CO2) laser skin resurfacing systems, deliver the most dramatic results but require significant downtime for recovery. Non-ablative fractional skin resurfacing lasers like the Fraxel deliver gentler, milder results and require minimal downtime, you can expect to be pink and puffy for approximately 4-5 days but you can wear makeup after 24 hours and resume normal activities. Although ablative and non-ablative procedures all involve laser skin resurfacing, the procedures are performed differently and they produce different results. Non-ablative fractional skin resurfacing goes deep into the epidermis of the skin and stimulates the production of collagen, a protein that’s found in connective tissue. Collagen causes the skin to plump up, and as it does, the collagen fills in wrinkles and lines. The result is firmer, smoother, suppler and younger-looking skin. Because non-ablative skin resurfacing is performed within the skin rather than on its surface, there is minimal discomfort and no downtime. Over time, as collagen in the skin is destroyed by aging, sun damage and pollution, the skin takes on a loose, saggy and blotchy appearance. Non-ablative Fraxel laser resurfacing uses light energy to create tiny pinpricks deep in the skin that ramp up collagen production. Unlike traditional fractional CO2 lasers, Fraxel lasers can accomplish their work without damaging the outermost layers of the skin. If your wrinkles are mild to moderate, Fraxel non-ablative laser treatments can give you a younger-looking face with minimal discomfort. Although the fractional CO2 laser works best for acne scars, deep lines and wrinkles, the non-ablative Fraxel laser treatment is a great option for anyone whose fine lines and wrinkles are not deep. Non-ablative skin resurfacing is also an excellent treatment for dark spots, sun spots and skin discolorations; it penetrates the skin and causes these spots to rise to the surface so they can be removed. While there is no doubt that fractional lasers are excellent for non-rosacea skin, it cannot be over-stated how dangerous these can be on rosacea skin and those with pre-rosacea tendencies such as familial rosacea, frequent flushing and blushing, and hyper-reactive skin. Everything that makes fractional lasers exceptional for regular skin lie at the heart of how these lasers can cause irreversible harm to rosacea sufferers. Just as important, 9 out of 10 physicians will perform these ablative procedures on rosacea sufferers… without a second thought. Permanent Skin Damage: Even the gentlest fractional laser can cause permanent scarring on rosacea skin. Resurfacing lasers can activate fibroblasts which cause hardening of inflamed skin cells — a common response in rosacea sufferers and the complete opposite of the intended effect. This trauma often leaves the epidermis permanently thinner and breaks down this protective barrier permanently. In many cases, these side effects are permanent. Absolute caution must be advised when considering any form of treatment with a resurfacing laser. There is no such thing as “minimal downtime” or “devoid of side effects” when it comes to the use of these lasers on rosacea skin. 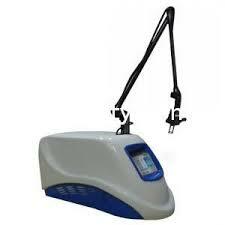 Increased Blood Flow: Treatment with fractional lasers can often increase blood flow for four to six weeks. This can cause many rosacea sufferers to progress to more severe stages of the disorder and increase the number of triggers they experience on a daily basis. Clear superficial skin is not worth triggering rosacea progression. It must be stressed that there is no technique at this time to limit these side effects. The heat generated from hundreds of tiny laser beams is too much for rosacea skin. 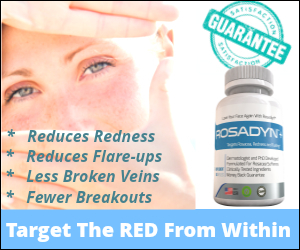 Stimulates Growth of Many New Blood Vessels: Uncontrolled growth of new blood vessels lies at the heart of rosacea pathogenesis. Thus, stimulation of even more blood vessels not only cause flares, but it can cause progression to more severe stages of rosacea. Increases Flushing Intensity and Duration: Following fractional laser treatment many rosacea sufferers report that they flush more often each day and the intensity of the flush is greatly increased. This is because the heat from fractional lasers has damaged rosacea blood vessels, increased the number of blood vessels and made these blood vessels more hyper-reactive. Often times, this side effect is not reversible. Actions on Sensory Nerves: These fractional lasers damage and irritate sensory “burning nerves” and “itching nerves” located in the surface of the epidermis. These uncomfortable sensations can last from a few hours to all day long. This can be quite painful — mimicking a bad sunburn. Comments, feedback and online discussions below in the Comment Box help other rosacea sufferers understand their rosacea better and an informed rosacea sufferer usually finds more effective treatments… and in doing so, they may add a comment that helps you just as much. Please contribute. 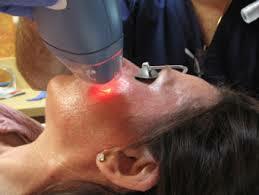 Have you ever had laser resurfacing or fractional lasers used on your skin? Did it make your rosacea and triggers worse? Did you use vascular lasers to reverse the side effects of resurfacing lasers? If so, please tell us what lasers you used and how many treatments were required? Do you have any advice for rosacea sufferers suffering from post-resurfacing side effects?